After a sunny weekend, the sky is back to its grey wintering colours again. I should have enjoyed the blue sky and the warm 10 C more (10 C in february means “hot”), but instead, I was at home doing some ordering and enjoying cookies and a cup of tea while watching The Umbrellas of Cherbourg (Les Parapluies de Cherbourg in the original french title), and I guess that now I’m almost ready for seeing foreign languages films in the theaters. Whereas I’m still insecure when it comes to speaking/listening danish (Hvad siger du? Arghhhhh! )*, the reading has been quite ok, though the fact the film’s plot was nothing complex and the singing dialogues were quite simple helped. At the beggining I was a little bugged by the non-stopping singing and the obviousness of the entire film. A young couple in love, the girl’s widowed mother who owns an umbrella shop is going through financial issues and doesn’t see with good eyes her 17-year old daughter’s romance with the poor young man. The guy leaves to some war without knowing the girl got pregnant, he comes back years later and… Nevertheless, the beauty of the costumes and art direction made me follow each scene after the other, and overall, I liked the film. Geneviève (a pre-Buñuel Catherine Deneuve) and her mom might be going through hard times, but they sure can display one different outfit after the other inside or outside their umbrella shop. 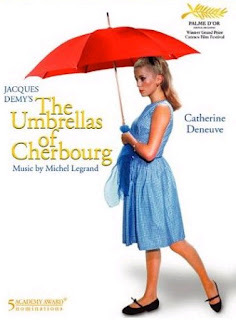 Too bad I didn’t find so many pictures of the movie, as the early 1960s costumes are just so pretty with a slight innocent touch due to the pastel fabrics and how Deneuve wears them with ballet flats and a good girl hairdo. Which is quite remarkable is the phisical transformation the character goes through in the end. Deneuve, at the age of 21, was quite convincing as a teenager and afterwards, as a sophisticated mature woman. It’s true that she acquires elegance in natural gestures, but the costumes and make-up definitely helped through her characterization.